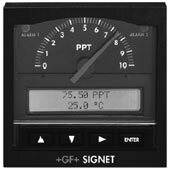 The +GF+ SIGNET 5700 pH/ORP Monitor is a versatile and intelligent instrument that recognizes the type of sensor connected, either +GF+ SIGNET pH or ORP Electrode, then automatically sets itself for the corresponding display and functionality. Also, during "Easy Cal" operation, the monitor automatically recognizes standard buffers/test solutions thereby shortening and simplifying routine calibration procedures. Two programmable relays and one scaleable 4 to 20 mA output are included, and the four-button keypad arrangement with intuitive software design is very user-friendly. The monitors require 12 to 24 Volts, AC or DC, and can be used with the +GF+ SIGNET 2720 pH/ORP Preamplifier and Sensor system, or with sensors from other manufacturers by using the 2721 Preamplifier. Several useful accessories are available, including the optional Rear Cover Kit used to extend the NEMA 4X/IP65 integrity of the front panel to the entire enclosure. 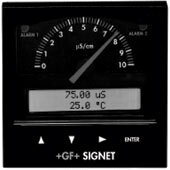 The +GF+ SIGNET 5800CR Conductivity/Resistivity Monitor is equipped with a scaleable 4 to 20 mA output and two programmable relays for simple and convenient process control and monitoring. Temperature is selectable for display in either ?C or ?F, and compensation is automatic and programmable (meets USP requirements). 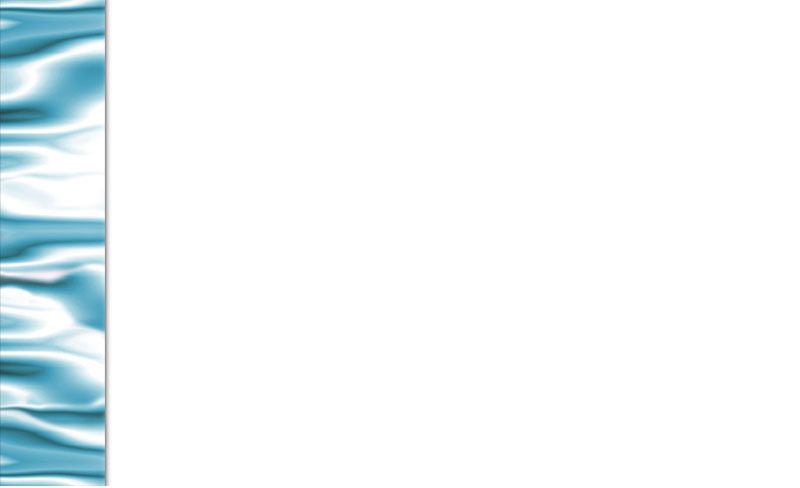 The monitor requires 12 to 24 Volts, AC or DC, and can be used with the +GF+ SIGNET Conductivity Sensors listed below. The four-button keypad arrangement with intuitive software design is user-friendly, and the NEMA 4X/IP65 integrity of the front panel can be extended to the entire enclosure by using the optional Rear Cover Kit. 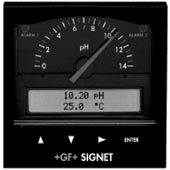 The +GF+ SIGNET 5900 Salinity Monitor utilizes conductivity sensors to provide direct reading, including calibration, of salinity in parts per thousand (PPT). Equipped with a scaleable 4 to 20 mA output and two programmable relays, the monitor requires 12 to 24 Volts, AC or DC, and can be used with +GF+ SIGNET 2822 and 2823 Conductivity Sensors (10.0 and 20.0 cell constants, resp.) Temperature is selectable for display in either ?C or ?F, and compensation is automatic. Calibration is simplified with single-point salinity and temperature entry via the wet-cal menu sequence. The four-button keypad arrangement with intuitive software design is user-friendly, and the NEMA 4X/IP65 integrity of the front panel can be extended to the entire enclosure by using the optional Rear Cover Kit.